In first and second grade, your child will be expected to learn addition and subtraction math facts and may even have to take timed tests. In addition to completing worksheets, your child can practice these math concepts with online math problems and games. This playful site offers free online flashcards that help students practice addition, subtraction and other arithmetic facts. 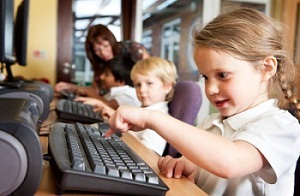 The way the flashcards work is that one large, colorful box appears onscreen at a time with a question in the middle (5 + 4, for example) and your child can just type in the answer using the computer keyboard and press enter. Then, a new question appears. This low-stress way of practicing math allows your child to work independently in an untimed environment. This site also has a self-grading quick quiz that your child can complete to prepare for timed tests. In the addition quiz, twenty problems appear onscreen at a time. Once your child enters his or her answers and presses 'grade my quiz,' each problem will either get a green check mark or a red x. The total percentage of correct answers will be listed at the top of the page. You can download free, printable worksheets from Math-Drills.com. Here, you'll find plenty of addition and subtraction questions in varying levels of difficulty. For example, you can choose 1-digit, 2-digit or multiple-digit subtraction, as well as worksheets with mixed addition and subtraction questions. All of these worksheets are made specifically to be printed and cannot be completed online. Each comes with an answer key, but the answers are given exclusively in numbers. If your child needs detailed, written explanations, another site may be more helpful. Some of the addition activities deviate from the traditional worksheet format. For instance, you'll find charts, where children are asked to add the number in the horizontal row with the number in the vertical row and fill in all the middle boxes. Games can be a great alternative to worksheets, which your child may feel resemble homework a little too closely. This site, which originated as a research project at the University of Kansas' School of Education, offers free online video games on a variety of math topics. If your child needs practice in addition she can play addition games such as Kitten Match or Alien Addition. Subtraction games include Island Chase or Tug Team Sailboat Subtraction. The games can be played by a single child or several children at a time.